Panoramic photo from the Clingman’s Dome tower panning from northwest to the southeast with Mt Leconte prominent in the center and the Gatlinburg / Pigeon Forge area to its left. Looking back down the steep path to the Clingman’s Dome parking lot on my 4th repeat. It took nearly 21 hours, over 6 hours longer than I was anticipating as a worst case scenario, but I climbed to the highest point in Tennessee five times plus a sixth partial lap to reach the elevation of Mount Everest. It was quite the adventure … read on to hear all the details! 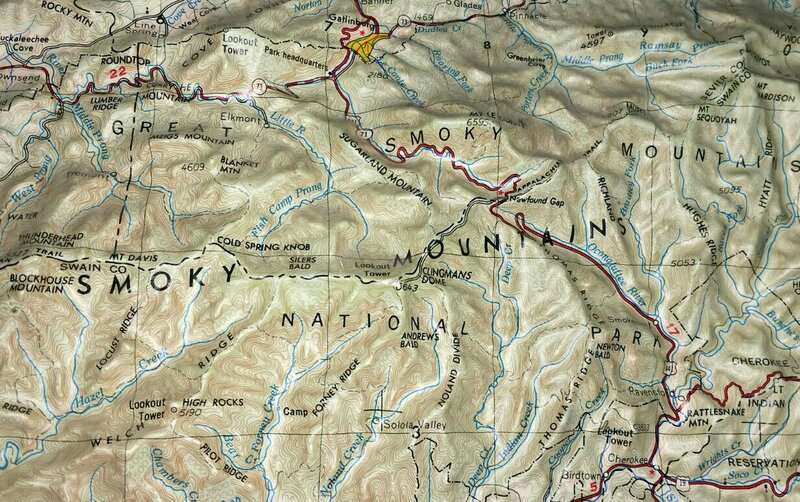 Raised relief map zoomed to Clingman’s Dome. Raised relief maps collaged together and mounted on our basement wall. The mountains have always called to me – my first day at Clemson as an 18 year old I hopped on my bike and headed straight up Hwy 133 north towards the mountains. As soon as I saw the first blue peak rising above the hills, my heart leapt and I knew I was home. 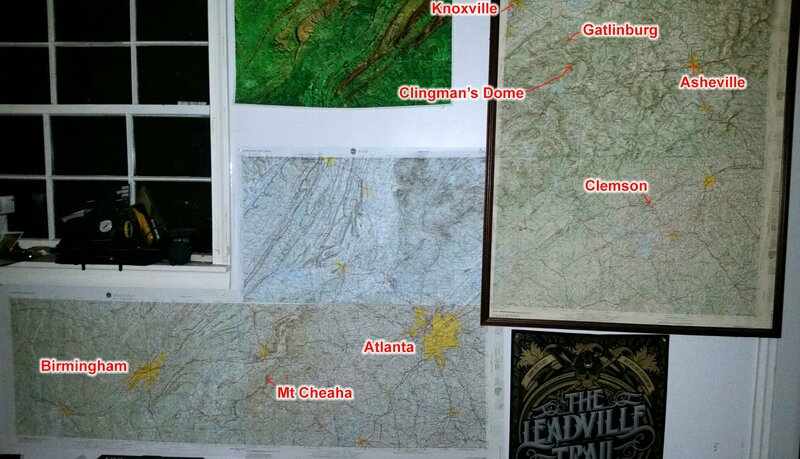 A senior teammate on the cycling team was graduating, and he gave me all of his 1:24,000 scale USGS topo paper maps he used to find roads and plan routes. I got really interested in the maps and stopped by a map store in Greenville where I saw a tiled map of the Knoxville and Greenville raised relief maps framed in the store. I bought the two maps, bought an exacto knife, and cut the molded plastic so that the two maps would line up together, glued them together onto cardboard, and then took it to a frame shop in Clemson so they could frame the two maps together. The end result is the framed map seen in the pictures above, which I have now had for 20 years and taken with me everywhere I have lived. One feature of the map that really stands out is Mt Leconte with its prominence immediately above the road (Hwy 441) that runs right below it. I can recall looking at that and wondering what the view would look like. Fast forward more than 10 years to 2006 to the first time I attended the annual ACM conference in Gatlinburg. I brought my bike with me and got up early to ride before the conference. I rode out of town on Hwy 441 and started the climb thinking that every mile or two I could see the gap that must be the top of the climb. Well, eventually I ran out of time and turned around and rushed back down to make it back to the conference but not before nearly falling on the ice and getting chilled to the bone in the rain back at the bottom. In 2010, I made it all the way to the top, and then slid out on some ice on the way back down. In 2011, I climbed the mountain twice as part of a 117 mile adventure that included riding the Blue Ridge Parkway all the way to Waterrock Knob turning around climbing back up and over Newfound Gap (but not all the way up to Clingman’s the second time). 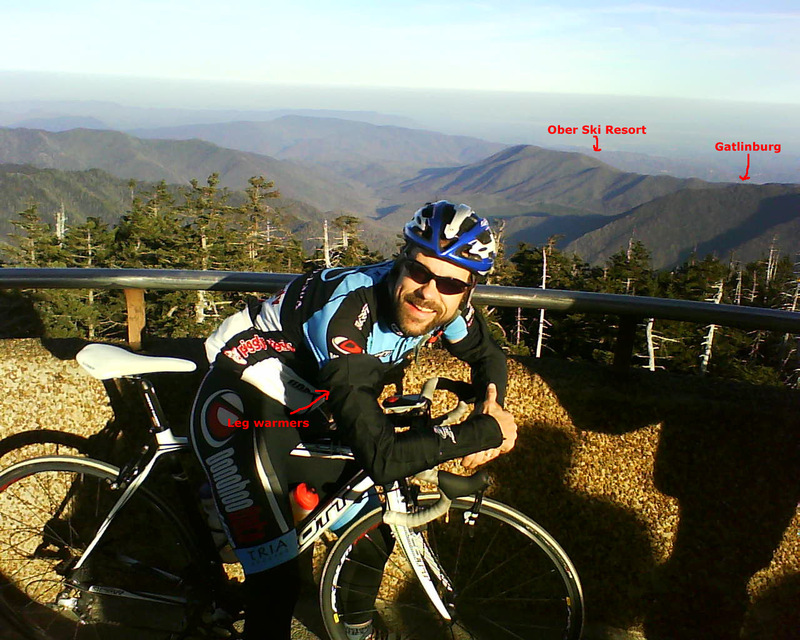 The following year (2012), I went on a 135 mile ride again climbing the climbing the mountain twice, but this time all the way up Clingman’s Dome both times. I was going for the KOM on the climb the first time up, but was 16 minutes short of Jeremiah Bishop’s time on the Gatlinburg side (who had set the KOM the day after racing the Cohutta 100 MTB race!!!) and less than a minute off the KOM time on the Cherokee side towards the end of my ride. In 2013, I brought my mountain bike and went on an epic mountain bike adventure on and off the Blue Ridge Parkway starting in Cherokee. Then last year (2014), I made my first attempt to everest Clingman’s Dome, but failed because of the freezing cold weather. So that brings us all the way up to this year, where I was able to everest the climb. Wearing lots of hats today! The ACM Midsouth Conference is an all day conference usually on the second Friday in November. I typically leave Birmingham Thursday afternoon and arrive late Thursday night or early Friday morning and either take a short nap or go for a bike ride before the conference begins. This year my daughter had a role in the Music Man at her school, and Thursday night was opening night. So I decided to wait until after the play to leave. But I wasn’t quite finished with the app I was writing to make judging the student competition easier. At 1:45 in the morning, I ran my final tests and everything seemed to be working in the app, so I packed up everything really quickly and left Birmingham shortly after 2AM. With nobody on the roads, I flew up to Gatlinburg and made it there by 7 in the morning. There was no point in trying to sleep before the conference, so I got my bike out and rode up to the Rainbow Falls parking area on Cherokee Orchard road. Cleaning out the car today and found the sign I had left on the hood for the park rangers wondering about the car in the lot. Before starting, I went inside the visitor center and talked to a ranger to make sure it was OK to leave my car in the parking lot overnight. He said it was not a problem, and he called in my license plate to the park dispatch office so that any rangers who might call in about the car would be told that I was out biking on Hwy 441 all night. I also made a sign (see pic above). There was a lot of traffic leaving Gatlinburg and climbing up Hwy 441. I’m not sure where all the people were going – I guess it was a combination of Gatlinburg vacationers heading over to Cherokee to hit up some casinos, or people driving up to the top of the mountain to watch the sunset or go for a night hike, and also probably some day workers heading back home to the mountains of North Carolina after working in Gatlinburg all day. My first lap was by far the fastest as it only took 2 hours and 4 minutes for the climb and a little over 45 minutes for the descent. I also stopped at the top for a few minutes taking pictures and putting on the warmest clothes I had brought with me (a vest and arm warmers). Temps were in the 40s at the visitor center when I left, and I had expected temps to drop down maybe into the 30s so I decided I didn’t need to haul my heaviest winter clothing up to the top with me on the first lap. This was a big mistake because the temps dropped rapidly past the 360 degree loop tunnel until they were in the low 20s by Alum Cave. There was some warmer temps higher up on the mountain, but generally the temp was below freezing the rest of the way up to the top. On such a long descent, you need to have really warm clothes for that kind of temperature. I was so cold by the bottom again this year that I contemplated abandoning the attempt after the first lap. I had my car at the bottom, though, so I hopped in the car and put the heat on full blast and sat there eating and warming up for over an hour! This was the only lap I was worried about being told I couldn’t ride my bike all the way up to the top. I ran into the sunset crowd of cars already leaving the top when I still had 7 miles to climb. By the time I finished that section of the climb, it was 45 minutes later and there was very few people left in the parking lot and zero people on the path up to the tower. I hopped the curb and rode all the way to the top in the dark post-sunset expecting to see some people at some point, but there was no one there at all! I had the tower all to myself, and the view of the Gatlinburg / Pigeon Forge lights with just a very faint glow of sunset left was amazing. I hit the 1000 meter spot on an overlook looking back down towards Alum Cave. I like how you can see the car headlights of cars climbing up the mountain much farther down. I saw a turkey on the side of the road just after the Chimneys picnic area. I put on my absolutely warmest clothes when I left the car for the second lap. I was dripping sweat within two miles of leaving the car, so I stopped and took off my heavy jacket and stuffed it back into my backpack. I also took off my gloves and rode without gloves the rest of the way up to the top. Temps were still down in the 20s through Alum Cave, but there was a big change in the temp from Newfound Gap up to the top of Clingman’s. Temps had risen quite a bit and it was well above freezing in the mid to upper 30s. At the top, I switched back into my warmest clothes and with the higher temps at the top, it was a much more manageable descent until very near the bottom where the cold air had already started to settle in. This time I sat in the car with the heat blasting for just 25 minutes before heading out again. This was the lap where I saw the most wildlife, scaring a small black bear as I descended down towards Newfound Gap. Then while I was warming up in the car before the start of the third lap, I saw two somewhat large coyotes cross the parking lot right behind my car and head up towards the road. I was surprised at how much traffic was still on the road at 9PM on a Friday night. I would get passed by packs of cars and I was always concerned that the last car in the line would not be paying attention and not see me after the other cars passed me. Fortunately, there were lots of pullouts for slow moving traffic, and most of the time I was near enough to a pullout that I could hit the climb hard to make it to the pullout before the line of cars reached me. 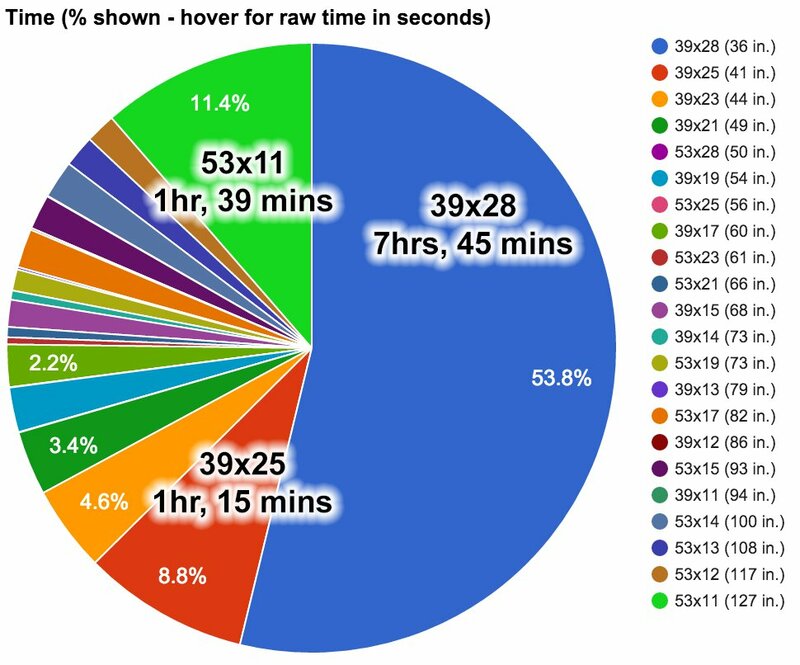 Plus, even though I was surprised by the number of cars still on the road, there weren’t nearly as many cars as when the road is really busy (see laps #5 and #6). I hit 2000 meters at the Chimneys picnic area, and I hit 3000 meters on the Clingman’s Dome tower road somewhere near the top. I started out with my lighter clothes and stuffed my heavy clothing into my backpack. This made for a freezing start to the third lap, but within a few minutes up the climb I was already toasty warm from the effort. Cars were gone on this lap. I saw maybe two cars coming down the mountain and got passed by two or three on a 2.5 hour climb. This was a hard lap, not because I was sleepy – I never got sleepy the entire ride – but because my legs were really tired. I had imagined this was going to be an easy everesting since the gradient is fairly gentle (5% average gradient). I was wrong. By the end of the second lap, my quads were quite sore. By this third lap, my left quad had a knot in it that really hurt. Plus my knees would twinge with pain that would mysteriously appear and disappear throughout the climb. The steepest part of the climb is the 0.6 mile path to the top with max gradient of 18% and average gradient of 13%. The first lap was nice spinning up this in my 39×32 easiest gear. The second lap was noticeably harder. This third lap was ridiculously hard even though my time was about the same as the second lap which already a few minutes slower than the first lap. The path is paved really well, but narrow, so even though I paper-boyed the entire climb that didn’t help cut the gradient much. I wondered whether I would be able to ride it without walking on the next lap. I hit 4000 meters on this lap at the Chimneys trailhead (2 miles higher up the mountain than the picnic area) and also 5000 meters on this lap very close to the Clingman’s Dome parking lot. Dark right now at 4000m, so here are some pics from this spot on the first lap. 5000m and the temp has started to rise a lot. Absolutely beautiful sunrise sky at the top on this climb. The pics way back at the top of this post were from the top of Clingman’s Dome on this lap. There was a nice couple who were totally shocked that there was nobody besides them and me up at the top to see the sunrise. What many people don’t realize is how long it takes to drive from Gatlinburg up to Clingman’s Dome … easily close to an hour by the time you park and do the hike up to the top. I think with the excitement of the sunrise sky, I was able to ride up to the top again only a few seconds slower than the previous lap. Still, it was tough and I was counting the benches along the path just waiting to see Bench #4 (last bench before the turn where the gradient eases up). On the descent, I saw the same turkey as the night before on the first lap (or at least it was the exact same spot). This time I was going fast and on his side of the road, so I swerved to avoid it as I thought it was coming out onto the road. Instead it just continued to root in the grass and leaves immediately adjacent to the road. I hit 6000 meters on this lap at the Alum Cave trailhead. I didn’t quite make it to 7000 meters on this lap, but I was close enough that I went ahead and posted the pictures from the tower at the top. 6000m at the Alum Cave trailhead. I couldn’t help but laugh at starting my last complete lap with another partial lap still to go PAST the time I was expecting to already be finished. Based on the fact that I was getting passed by packs of 10 cars at a time every few minutes, I probably got passed by 200-300 cars on the 3 hour climb up to the top. The parking lot was jam packed with cars and there were people everywhere including two park rangers, who asked me to park my bike and walk up to the top. The hike is far too long on speedplay cleats, so I took my shoes off and hiked up in my socks. Amazingly, it only took 16 minutes to hike up in my socks compared to 8 minutes to ride up it on the previous lap. That’s how steep the climb is! Of course, the hike back down took about 16 minutes as opposed to 2 minutes on the bike. Still, in the grand scheme of things this only added 22 minutes to my everesting time – not that it really mattered – I was far past the point of caring about my overall time. On this final complete lap, the only milestone I hit was 8000 meters at the Newfound Gap overlook and was roughly 1000 feet short of everesting by the Clingman’s Dome tower so I knew I would have to do another partial lap to complete the everesting. Heading out now, almost done! Finished! 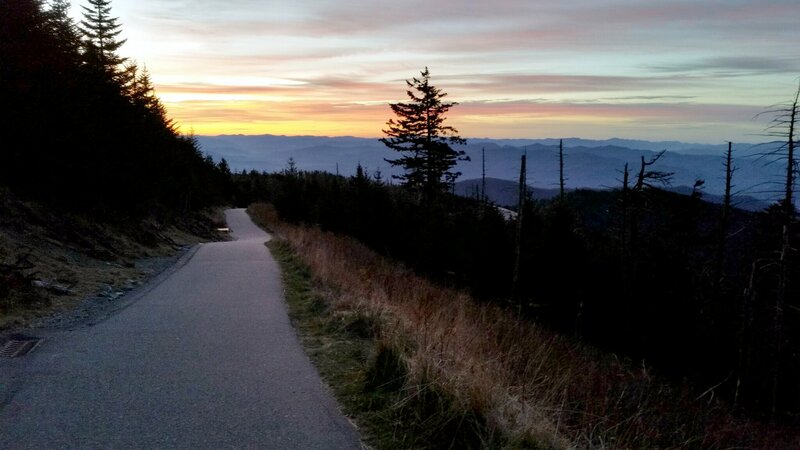 Clingman's Dome has been #everested #everesting – definitely hardest of the three everestings I have done. This is the river I just rode a couple hundred miles up and down! This was only my second ride with a 32 tooth cassette, and it was wonderful. 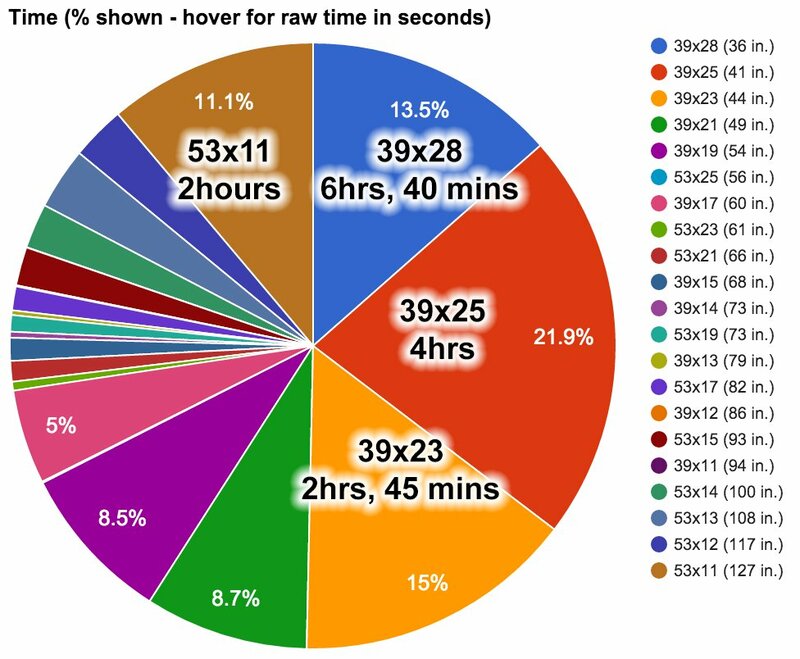 Probably the most interesting data related to that is how much time I spent in the 32 compared to the 28 on my other everestings. With Mount Cheaha, I was clearly overgeared. With Karl Daly, the climb is so much flatter and shorter than either of the other everestings I have done that there isn’t as much need to be in the 28 even when dead tired towards the end. Here is a comparison from the three everestings. 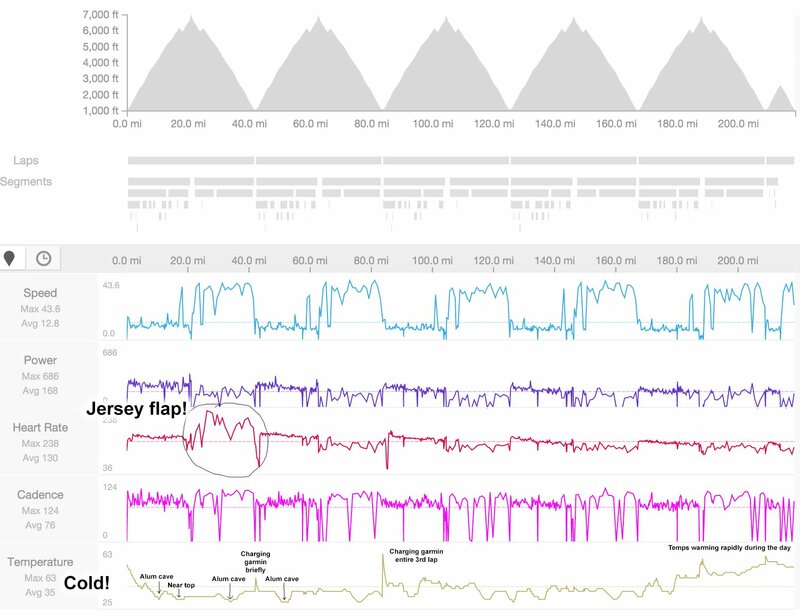 Interactive data from my three everestings is available on di2stats.com and strava.com on the links below. One item that isn’t covered in the data is the issue of my backpack and heavy winter clothing. For both the Karl Daly and Mount Cheaha everestings, I was close enough to my car at all times that I only needed to take a small patch kit and CO2 with me on each repeat. With Clingman’s Dome, I had to take a fully loaded backpack with lots of water, food, and heavy winter clothing for the long descent since each repeat took between 2 and 3.5 hours depending on how exhausted I was. Huge thanks to everyone who sent messages of encouragement – I saw a few of the messages in the two spots on the climb where I had cellphone coverage (the bottom and the top). Also, huge thanks to Kristine, who I called several times during the ride and she encouraged me each time. And finally, big shoutout to Craig Tamburello at Brick Alley, who got a long cage rear derailleur and 32 tooth cassette installed for me on the same day I was leaving for the conference. 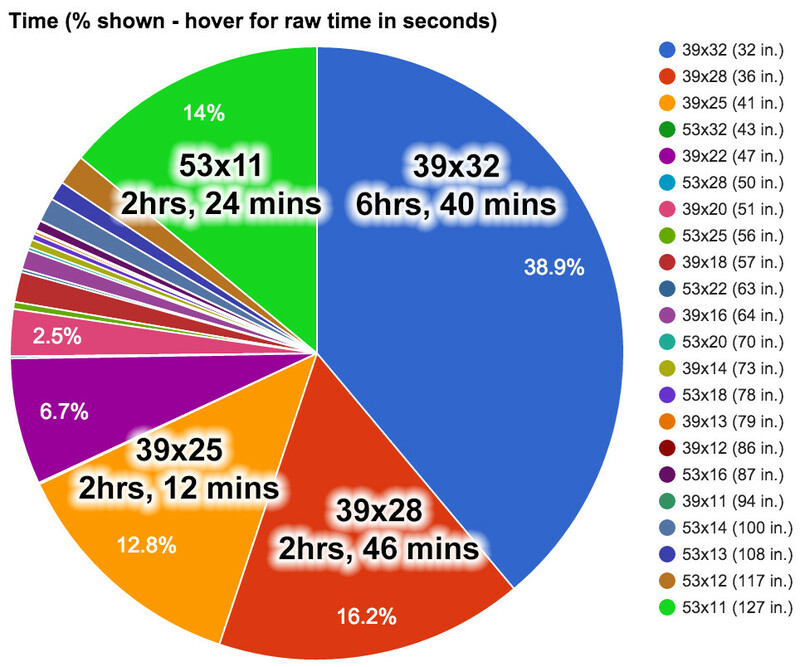 Shifting was flawless, and I’m not sure the 28 tooth cassette I had been running would have been enough for the later laps – especially the steep tower climb at the end. This entry was posted in Adventure, Off-season, Training and tagged epic, hard on November 17, 2015 by kartoone.